Which brings us in a tangental (sp?) 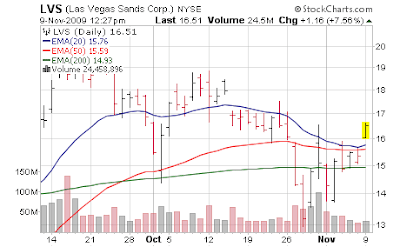 way to Las Vegas Sands (LVS) and its Macau IPO in Hong Kong. Whereas just 10 days ago the talk was the IPO would bring in $2B to $3B, we've seen the terms set today and the low end is up by $500M and the top end by $300M. Not too bad for 10 days of money printing. Maybe they should wait another week, maybe they could get $4B? Another month more? $5B? I'll be curious if there is a "sell the news" reaction once the actual IPO hits but there is no denying the more the company gets from the IPO the more debt they can extinguish. Somewhere, Mervyn King and Ben Bernanke are exchanging hugs. Shares of Las Vegas Sands Corp (NYSE:LVS - News) rose 7 percent on Monday after the casino operator said it would look to raise up to $3.35 billion through an initial public offering of shares in its Macau business. The IPO of the Macau assets "does give the company much needed extra liquidity and flexibility, so it is a positive development for Las Vegas Sands and a positive sign for the industry in general that they are able to tap that market," said Matthew Jacob, an analyst with Majestic Research. Las Vegas Sands said in a filing with the Securities and Exchange Commission that the offering price for the 1.87 billion shares of Sands China Ltd. was expected to be between $1.34 a share and $1.79 a share. The gaming and casino company has struggled with a heavy debt load, and is looking to seize on an opportunity to have a publicly traded division in Hong Kong at a time when the IPO window is open.